It's that time! 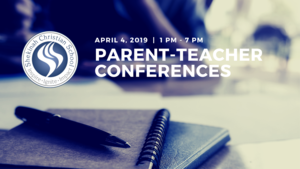 Please sign up for parent-teacher conferences coming up on April 4th! A parent-teacher conference is a face-to-face meeting between teacher and parents (or guardians) of a student. It is an opportunity to discuss a student's academic progress and social behavior. Students are dismissing early at 12:30 so that conferences can begin at 1:00 in the afternoon. If you would like to meet with any other staff members, please email the office at schooloffice@shekinahchristian.org.